Sophomore Madison Corcoran helps make bagged lunches for those in need at Feed The Many. 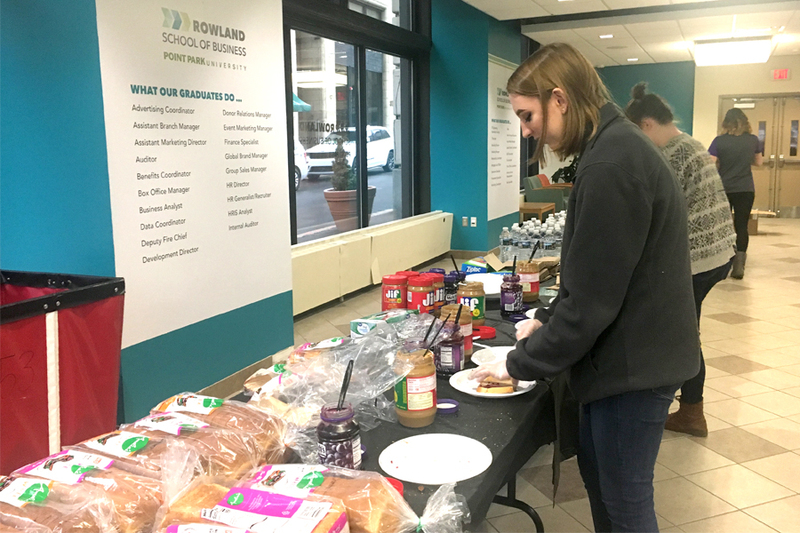 Last Thursday on Jan. 24, in light of Martin Luther King Jr. Day, the Campus Activities Board (CAB) held an event to provide bagged lunches for the needy. Kate Smith, senior business management major and Executive Director of CAB, says the campus community likes to honor the holiday while giving back to those less fortunate. This year’s event held in West Penn was no exception. “Well, every year we like to do something for Martin Luther King [Jr.] Day and last year we did a brunch for all the student leaders on campus, but we wanted to give back to the community in a more in-depth way this year,” Smith said. This year, CAB partnered with the SAIL office and reached out to Operation Safety Net (OSN), a medical and social outreach program in Pittsburgh that works with shelters for women, and those homeless and in need on the street. They decided that a good way to give back would be by making bagged lunches that the organization could then distribute to their partners. “We thought this would be the best way to give back, use that money that we would’ve put toward a brunch and buy all these materials and make over 350 bagged lunches,” Smith said. The materials were assembled on tables in West Penn for students to come and participate in the process. Each lunch had a peanut butter and jelly sandwich, a granola bar and a bottle of water. Allison Hritz, a sophomore secondary education social studies major with a dual in special education, felt moved by the idea. She was joined by her friend Madison Corcoran, also a sophomore secondary education social studies major. She and Hritz are both in the club Campus Cursive. Smith said she hopes to put on more events like this in the future. CAB chose OSN because they were familiar with the organization and the work they do in the community. Sabrina Bivins of OSN said that it’s great when people can see the kind of situations people are in of those less fortunate and see it in their heart to give back, especially during this time of the year. “We get most of our donations in the winter, probably half of our donations occur during the winter months,” Bivins said. The bagged lunches that students at Point Park prepared will be distributed to multiple centers, Bivins said, with each organization typically taking a box.